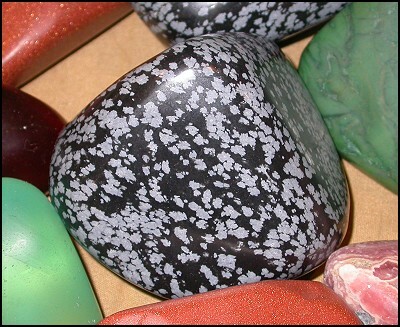 Snowflake obsidian, with its supposed healing powers. Even if for me those are symbolic, it soothes. Today, I want to offer my version of a self-help project. I had to laugh when this idea came to me last week because it resembles in some ways the same kind of saccharine self-help project that all the fake happiness gurus promote. Once again, I find myself making what is perhaps a narrow distinction: my self-help project, I believe, is different in that it acknowledges the full power of negative things in my life. It simply is an attempt to create a space, albeit small, where I can retreat from some of those negative things. This all came about because several people suggested strategies for coping with my return to campus from my lovely year of sabbatical—my trainer suggested that I spend time between classes going through my assigned stretching exercises—“It will be more crucial now more than ever,” she said, “in order to keep the stress from making you seize up again.” One friend noted that I should make a common practice of shutting my office door. And my dear friend Gigi said I needed to fill up my pockets with snowflake obsidian and create an altar in the corner of my office. I liked all of these ideas, but dwelt a little bit on the last one. To what could I make an altar that would transcend the moment? And would I want one that everyone who walked in my door could peruse and comment on? I decided instead that I would make a sabbatical-in-a-drawer. Note that I am still in the idea stage of this project. I have cleaned out a desk drawer at work and started collecting things to put into it—photos of Bruce and the cats, little tchotchkes that remind me of far-off places and people, beautiful fabric, and, yes, bits of snowflake obsidian, that healing gem. I’m also planning to buy a calligraphy pen and some nice paper for a list of my stretches and some little reminders, such as “Think about what you want versus what your ego wants” and “What’s different now?” Maybe I will even include a small frame to remind me to keep shifting my attention from the unhealthy scene right in front of me to the wider horizon or the inner landscape. One of the things I really like about this idea is that it won’t be out for everyone to see. Rather, when I have a few minutes and need a little rest, I can simply close my door and open the drawer. In it I hope to create a little magic and a lot of distance from the day to day that so often burns me out. It may be a little like the wardrobe in the C.S. Lewis classic The Lion, the Witch, and the Wardrobe. Yes, these worlds of the imagination have their own dangers, but they are ones we can confront, ones we long for. My desire to keep it private makes it a little odd for me to write about it here on the blog, but one of my friends said she really wanted to share the idea with another friend of hers, and we started talking about the whole concept of sabbatical and how we could import that into our daily work lives. People in most walks of life, after all, don’t have the option of official sabbaticals, though I did find some web resources for those wishing to negotiate one in other professions. I heartily recommend you do so if you can. At any rate, even for those who have the possibility, there are few of them and they are very far between. Many of us also live with heavy workloads and a lot of stress, even when we love what we do. And many of us work nearly non-stop, seven days a week. Few of us any longer have a designated day of rest, much less any longer period of time when we can pause and reflect on our work. “Speak unto the children of Israel and say unto them: ‘When ye come into the land which I give you, then shall the land keep a Sabbath unto the Lord. And God blessed the seventh day and sanctified it, because in it He had rested from all His work which God created and made. This ancient acknowledgement of the need for rest and refreshment after labor is one that is increasingly lost. Even in academia, sabbatical no longer really means “rest”; rather, it means working independently outside of the classroom. (We are required both to submit a plan of work in applying for one and to send in a report on our accomplishments when we are finished.) So, in one sense, my transition back to the classroom has not been difficult—it isn’t as though I have gotten used to doing nothing much. I have simply shifted my attention back to student work and less toward my writing, but the fact of work has remained continual. Emotionally, however, sabbatical was indeed a vacation—I didn’t have to deal with the office politics that eat up so much energy and create such feelings of despair in me. And so I find that I can create a sabbatical-in-a-drawer—a little free zone of emotional sustenance and beauty in a sometimes challenging world. I would love to hear about other sabbaticals-in-drawers that any of you make or similar ideas that help you keep your sanity and find moments of rest and emotional nourishment. These are, after all, requirements of life. Posted in Psychology, Uncategorized and tagged C.S. Lewis, Sabbath, sabbatical, sabbatical-in-a-drawer, self-help, snowflake obsidian, The Lion the Witch and the Wardrobe. Bookmark the permalink. Such lovely mood shifters already in your sabbatical-in-a-drawer. And what a fabulous idea. Maybe, too, a smell that transports you to a lovelier plane? For me, it’s usually a sprig of rosemary in my cleavage for quick retrieval. Deep breathing and healing aroma at the same time! A sound? A tuning fork or a tiny singing bowl? A kaleidoscope to momentarily shift your perspective? I used to keep a little one nearby that had mirrors instead of glass fragments. Everything I looked at became instantly muti-faceted, jewel-like in the moment which, after all, can be wonderful gifts during a sabbatical. Thanks for the lovely suggestions about incorporating all the senses. Great ideas. I have always wished I could bottle the East Tennessee piney smell. Alas, I have never found anything that comes close, but maybe I will try again. That scent would indeed be a balm. My sabbatical in a drawer is called Rum. I must admit that there’s some gin and sugar-free tonic in my home toolkit, though I’m not much for the alcohol. Bruce makes me a martini every now and then, but only when he really needs not to hear from me for awhile. Basically renders me unconscious at a very low level. And I have too many unfortunate and cautionary tales too close to my heart. Hart Crane. Robert Lowell. My uncle. My cousin. There are some habits it’s best to give up once you turn 40. But I’m glad at least that you do have a sabbatical in a drawer. We all need some kind. We did something similar in group therapy. Many people who self-harm keep what I’ll call a “hurting kit,” something secret that contains the tools with which they may hurt themselves. Instead, they’re encouraged to keep a “healing kit,” such as a squishy ball to hold when stressed, a Tangle (a tangly plastic toy good for fidgety hands), hard candy, some tiny vial of perfume or something else good-smelling, and so forth, capturing the five senses, as the other reader suggested. An uplifting quote, drawing, or photo of someone close could also be included, as well as a pen or marker with which to journal, or, if necessary, mark the skin. I feel like my “sabbatical-in-a-drawer” right now is the cluster of sites I visit on the Internet, though I realize that might be unhealthy. Each drawer opens another drawer, though. Certain people who I follow on Facebook, for example, give me the feeling of being uplifted or being whole. I don’t know how to explain it. Coming here helps. Perhaps my “sabbatical” is really the contents of my phone. But then, that can be overwhelming. This is something I’ll need to think about further. Thank you, Lisa.